Orlando's most Fun Place to Eat! Guaranteed by Dolly Parton herself Dixie Stampede is Orlando's most fun place to eat. With two fantastic shows and a very tasty four course meal for one great price...all the family will love this southern hospitality Dolly Parton style. The moment you walk into the Carriage room welcome show you know you are in for a good night with magnificent horses, American buffalo's, wait for this an 'Ostrich and pig race', singing, dancing which includes audience participation...excellent fun! Also, if you are visiting Orlando over November and December, Dixie Stampede's Christmas show is a must see show...based around the nativity, the true spirit of Christmas is brought together with the three kings, real camels, angels and shepherds and wonderful music. This Orlando dinner show is centrally based with all forms of transport available to you. Located opposite Orlando's Premium outlets, close to exit 68 0n the I4 and International Drive, this is a popular venue so reservations are required. Anyhow, by now you guessed we like this dinner show, so not to be biased...see below! Helpful links to check out. Dixie's Stampede dinner show might not be to everyone's taste, so here are a few useful links we have put together if you decide to visit. You might find these helpful to get a feel of the place before you arrive...especially if it's your first time to Orlando. Click the blue hyperlink of your choice and 'bookmark'. Road map and Directions...to the dinner show...Car Parking is free. Opening times...these are seasonal and do change through out the year. Entrance prices...Useful to know to pre-plan. Currency Converter...helpful tool to convert into your own currency if buying tickets online etc. Dixie venue... Here the fun starts...bookmark if required. Menu...Check the menu before you book. We find these links very helpful to pre plan and budget before you start your Orlando Holidays. With the personal travel forums, great savings on gate prices and down to earth advice...you decide if Dixie's Stampede dinner show is worth a visit. 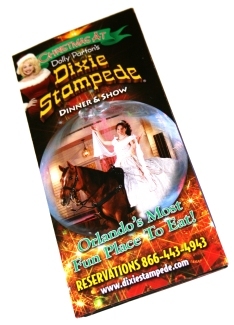 We will keep updating this page via our RSS feed regarding new additions, changes etc, so click onto the RSS feed to the left of your screen (no personal information required) to keep you on top off what's happening in and around Orlando, including what's new regarding Orlando dinner shows and Dixie Stampede. Think of us as your local paper boy, delivering your morning news free of charge. Great savings on most dinner shows, located in the Orlando and Kissimmee area.